'Tao' is a Chinese word meaning 'way', 'way of Heaven', 'Path' or 'road' or 'method'. It indicates a line or principle of conduct. There is no proper English term for 'Tao'. It means the 'Eternal Being'. The Founder of Taoism was Lao-Tze. Lao-Tze was born in 604 B.C. in the village of Chu-Jhren, in Li country, belonging to the Ku province of the State Chu. He was born under the plum tree (in Chinese 'Li'). He adopted it as his surname. The hair of the head was white when he was born. Hence he was called Lao-Tze (old boy) or philosopher, one who is child-like even when old. He was popularly called Lao-Tze. His name was Er (ear). He was called Tan after his death. 'Tan' means 'long lobe'. He had peculiar long ears. His appellation was 'Po Yang' or 'count of positive principle'. He was a keeper or recorder of the secret Archives in the Royal court of Chore. He was a State Historian. Lao-Tze says: Tao is one. It was in the beginning. It will remain for ever. It is impersonal, eternal, immutable, omnipresent, bodiless, immaterial. It cannot be perceived by the senses. It is nameless. It is indescribable. It is the first cause from which all substances take their origin and all phenomena flow. The great Tao is all-pervading. All things depend on it for life. It is the mother of all phenomena, of heaven and earth. It existed before the Personal God. It is the father of God. It is the producer of God. It is the originator of heaven and earth. It is the mother of all things. You will find that there is an aroma of Indian Vedantic philosophy in the teachings of Lao-Tze. Tao is everywhere. It is in the ant. It is in the grass. It is in the earthen-ware vessel. It is in excrement. It is in the highest place but is not high. It is in the, lowest place, but is not low. It is in ancient times, but itself is not ancient. It is in old age but itself is not old. It is everywhere, but appears to be nowhere. Laozi believed that females are the mothers of all things and all human beings. In accordance with Dao, which generates everything, females are those that produce all things. Without females or mothers, there is nothing else in the world. The Permanent De (or humanism) will never leave. From this perspective, it is easy to see that femininity and mothering were highly valued by Laozi. Simply speaking, nothing in the world is as important as women and mothers. If many philosophical and religious ideas tend to maintain male superiority or dominance, directly or indirectly (e.g., Confucianism; Hinduism; Christianity, including Mormonism; Islam; Chauvinism; or Freudianism), Daoism differs because females play a more important role in humanism than males. This point may not have been well understood in modern feminist research (see Laughlin & Wong, 1999). Perhaps philosophically or religiously, Laozi could be seen as one of the first proponents of feminism in human history. The "Tao Te Ching," "The Book of the Way and its Virtue," is one of the major source texts in Chinese Taoism. It contains 81 short poems or "chapters," and was probably compiled in the 6th-5th c. B.C.E., as a collection of sayings passed down from a much older, oral tradition. The name of its anonymous auther, Lao-tzu, means simply "old master." According to the commentator Ellen M. Chen, "of all the ancient classics still extant, the Tao Te Ching alone draws its inspiration from the female principle." "The reader will notice in the many passages where Lao-tzu describes the master, I have used the pronoun 'she' at least as often as 'he.' The Chinese language doesn't make this kind of distinction; in English we have to choose. But since we are all, potentially, the Master (since the Master is, essentially, us) I felt it would be untrue to present a male archetype, as other versions have, ironically, done. Ironically, because of all the great world religions the teaching of Lao-tzu is by far the most female. Of course you should feel free, throughout the book, to substitute 'he' for 'she' or vice versa." One important aspect of thought in the Tao Te Ching, the significance of which has been so far neglected, is its emphasis on the feminine. Of all ancient Chinese classics, the Tao Te Ching stands alone in explicitly speaking of Tao as the Mother of the World (25): It is the dark female animal (6); to reach union with Tao man need to abide by the female (28); the female animal overcomes the male animal by its stillness (61)." Tao Te Ching (the Classic of the Way and its Power), according to tradition written by Lao-Tzu. "The Tao that can be expressed is not the eternal Tao; the name that can be defined is not the unchanging name...There is a thing inherent and natural, which existed before heaven and earth. Motionless and fathomless, it stands alone and never changes; it pervades everywhere and never becomes exhausted; it may be regarded as the Mother of the Universe. I do not know its name. If I am forced to give it a name, I call it Tao, and I name it supreme... Man follows the laws of earth; earth follows the laws of heaven; heaven follows the laws of the Tao; and Tao follows the laws of its intrinsic nature." What is this Tao? The concept transcends the powers of reason and must be grasped intuitively, it is beyond words, beyond all differences and distinction, it is the unchanging, permanent reality of constant change, it is the ground of being and nonbeing, it is akin to the Hindu concept of the Brahman. It is serene. Empty. Solitary. Once, in China, as elsewhere, there was a Mother who was before heaven and earth came into being. Her image was woven into the age- old beliefs of the people and the shamanic tradition which later evolved into Taoism. In Chinese mythology the mother goddess has many names and titles. One legend imagined her as an immense peach tree which grew in the Garden of Paradise in the Kun-Lun mountains of the West and was the support of the whole universe. The fruit of this marvellous and magical tree ripened only after three thousand years, bestowing immortality on whoever tasted it. The Garden of Paradise belonged to the Queen of the Immortals, the Royal Mother of the West, whose name was Hsi Wang Mu, goddess of eternal life. Other myths describe her as the Mother or Grandmother, the primordial Heavenly Being, the cosmic womb of all life, the gateway of heaven and earth. Taoism developed on this foundation. More subtly and comprehensively than any other religious tradition, Taoism (Daoism) nurtured the quintessence of the Divine Feminine, keeping alive the feeling of relationship with the ground of being as Primordial Mother. Somehow the Taoist sages discovered how to develop the mind without losing touch with the soul and this is why an understanding of their philosophy - China's priceless legacy to humanity - is so important to us now. The origins of Taoism come from the shamanic practices and oral traditions of the Bronze Age and beyond. Its earliest written expression is the Book of Changes or I Ching, a book of divination consisting of sixty four oracles which is thought to date to 3000- 1200 BC. 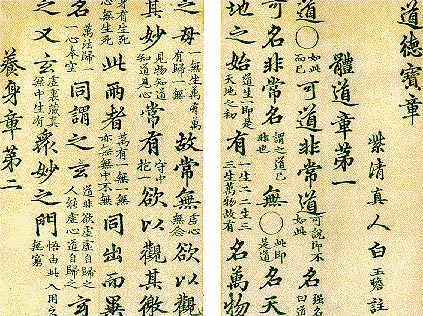 The complementary images of yin and yang woven into the sixty four hexagrams of the I Ching are not to be understood as two separate expressions of the one indivisible life energy: earth and heaven, feminine and masculine, female and male, for each contains elements of the other and each cannot exist without the other. In their passionate embrace, there is relationship, dialogue and continual movement and change. The I Ching describes the flow of energies of the Tao in relation to a particular time, place or situation and helps the individual to balance the energies of yin and yang and to listen to the deeper resonance of the One that is both. The elusive essence of Taoism is expressed in the Tao Te Ching, the only work of the great sage Lao Tzu (born c. 604 BC. ), whom legend says was persuaded to write down the eighty-one sayings by one of his disciples when, reaching the end of his life, he had embarked on his last journey to the mountains of the West. The word Tao means the fathomless Source, the One, the Deep. Te is the way the Tao comes into being, growing organically like a plant from the deep ground or source of life, from within outwards. Ching is the slow, patient shaping of that growth through the activity of a creative intelligence that is expressed as the organic patterning of all instinctual life, like the DNA of the universe. "The Tao does nothing, yet nothing is left undone." The tradition of Taoism was transmitted from master to pupil by a succession of shaman-sages, many of whom were sublime artists and poets. In the midst of the turmoil of the dynastic struggles that engulfed China for centuries they followed the Tao, bringing together the outer world of appearances with the inner one of Being. From the source which is both everything and nothing, and whose image is the circle, came heaven and earth, yin and yang, the two principles whose dynamic relationship brings into being the world we see. The Tao is both the source and the creative process of life that flows from it, imagined as a Mother who is the root of heaven and earth, beyond all yet within all, giving birth to all, containing all, nurturing all. The Way of Tao is to reconnect with the mother source or ground, to be in it, like a bird in the air or a fish in the sea, in touch with it, while living in the midst of what the Taoists called the "sons" or "children" - the myriad forms that the source takes in manifestation. It is to become aware of the presence of the Tao in everything, to discover its rhythm and its dance, to learn to trust it, no longer interfering with the flow of life by manipulating, directing, resisting, controlling. It is to develop the intuitive awareness of a mystery which only gradually unveils itself. Following the Way of Tao requires a turning towards the hidden withinness of things, a receptivity to instinctive feeling, enough time to reflect on what is inconceivable and indescribable, beyond the reach of mind or intellect, that can only be felt, intuited, experienced at ever deeper depth. Action taken from this position of balance and freedom will gradually become aligned to the harmony of the Tao and will therefore embody its mysterious power and wisdom. The Taoists never separated nature from spirit, consciously preserving the instinctive knowledge that life is One. No people observed nature more passionately and minutely than the Chinese sages or reached so deeply into the hidden heart of life, describing the life and form of insects, animals, birds, flowers, trees, wind, water, planets and stars. They felt the continuous flow and flux of life as an underlying energy that was without beginning or end, that was, like water, never static, never still, never fixed in separate things or events, but always in a state of movement, a state of changing and becoming. They called the art of going with the flow of this energy Wu Wei, not-doing (Wu means not or non-, Wei means doing, making, striving after goals), understanding it as relinquishing control, not trying to force or manipulate life but attuning oneself to the underlying rhythm and ever-changing modes of its being. The stilling of the surface mind that is preoccupied with the ten thousand things brings into being a deeper, more complete mind and an integrated state of consciousness or creative power that they named Te which enabled them not to interfere with life but to "enter the forest without moving the grass; to enter the water without raising a ripple." They cherished the Tao with their brushstrokes, observing how it flowed into the patterns of cloud and mist between earth and mountain peak, or the rhythms of air currents and the eddying water of rivers and streams, the opening of plum blossom in spring, the graceful dance of bamboo and willow. They listened to the sounds that can only be heard in the silence. They expressed their experience of the Tao in their paintings, their poetry, the creation of their temples and gardens and in their way of living which was essentially one of withdrawal from the world to a place where they could live a simple, contemplative life, concentrating on perfecting their brushstokes in calligraphy and painting and their subtlety of expression in the art of poetry. Humility, reverence, patience, insight and wisdom were the qualities that they sought to cultivate. The Taoist artist or poet intuitively reached into the secret essence of what he was observing, making himself one with it, then inviting it to speak through him, so releasing the dynamic harmony within it. He imposed nothing of himself on it but reflected the creative soul of what he was observing through the highly developed skills that he had cultivated over a lifetime of practice. Through the perfection of his art, he did not define or explain the Tao which, as Chuang-Tzu said, cannot be conveyed either by words or by silence, but called it into focus so that it could be experienced by the beholder. The Tao flows through the whole work as cosmic Presence, at once transcendent in its mystery and immanent in its form. The distillation of what the Taoist sages discovered is bequeathed to us in the beauty and wisdom of their painting and poetry, and in their profound understanding of the relationship between body, soul and nature, and the eternal ground that underlies and enfolds them all. Standing before one of the great Taoist paintings of the T'ang or Sung dynasties or reading a poem by Wang Wei, we are immediately transformed by them, able to let go of the things that normally distract the mind and exhaust the body - the preoccupation with the ten thousand things that the Taoists called "dust". They put us in touch with the center simply by relating us instantaneously to the ground which unites everything. 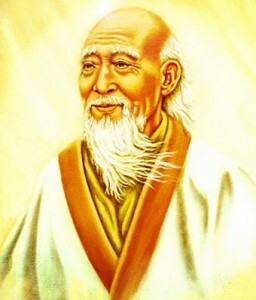 To rest in the quietness of mind and humility of heart that the Taoist sage embodies, is to live in a state of instinctive spontaneity that the Taoists named Tzu Jan - a being-in-the-moment that can only exist, as in childhood, when the effort to adapt to collective values and the need to accumulate possessions, power or fame is of no importance. What exists is what is. There is no need to change it by imposing the will. Change will come about by changing the quality of one's own being. To feel what needs to be said without striving to say it; to speak from the heart in as few words as possible, to act when action is required, responding to the needs of the moment without attachment to the fruits of action, this was the essence of the Taoist vision. It was essentially feminine, gentle, balanced, dynamic and wise. The image of the primordial Mother was embedded deep within the soul of the Chinese people who, as in Egypt, Sumer and India, turned to her for help and support in time of need. She was particularly close to women who prayed to her for the blessing of children, for a safe delivery in childbirth, for the protection of their families, for the healing of sickness. Their mother goddess was not a remote being but a compassionate, accessible presence in their homes, in the sacred mountains where they went on pilgrimages to her temples and shrines, and in the valleys and vast forests where she could be felt, and sometimes seen. Yet, like the goddesses in other early cultures, she also had cosmic dimensions. Guardian of the waters, helper of the souls of the dead in their passage to other realms, she was the Great Mother who responded to the cry of all people who called upon her in distress. She was the Spirit of Life itself, deeper than all knowing, caring for suffering humanity, her child. Above all, she was the embodiment of mercy, love, compassion and wisdom, the Protectress of Life. Although she had many names and images in earlier times, these eventually merged into one goddess who was called Kuan Yin - She who hears, She who listens. By a fascinating process which saw the blending of different religious traditions, the ancient Chinese Mother Goddess absorbed elements of the Buddhist image of the bodhisattva Avalokitesvara, the Tibetan mother goddess Tara and the Virgin Mary of Christianity, whose statues were brought to China during the seventh century AD. The name Kuan Yin was a translation of the sanscrit word Avalokitesvara and means "The One Who Hears the Cries of the World." At first, following the Mahayana Buddhist tradition, this compassionate being was imagined in male form, but from the fifth century AD., the female form of Kuan Yin begins to appear in China and by the tenth century it predominates. It was in the far north-west, at the interface between Chinese, Tibetan and European civilizations, that the cult of Kuan Yin took strongest root and it was from here that it spread over the length and breadth of China and into Korea and Japan, grafted onto the far older image of the Mother Goddess. Every province had its local image and its own story about her. Taoist and Buddhist elements were fused, creating an image of the Divine Feminine that was deeply satisfying to the people. By the 16th century, Kuan Yin had become the principal deity of China and Japan and is so today. Robed in white, she is usually shown seated or standing on a lotus throne, sometimes with a child on her lap or near her for she brings the blessing of children to women. Chinese Buddhist texts describe her as being within a vast circle of light that emanates from her body, her face gleaming golden, surrounded with a garland of 8000 rays. The palms of her hands radiate the colour of 500 lotus flowers. The tip of each finger has 84,000 images, each emitting 84,000 rays whose gentle radiance touches all things. 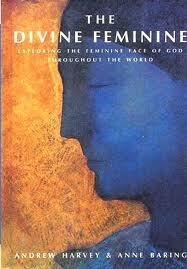 All beings are drawn to her and compassionately embraced by her. Meditation on this image is said to free them from the endless cycle of birth and death. Her embroidered girdle sways like a phoenix's wing in flight. Taoist belief draws from indigenous Chinese religion and incorporates that thought into its schema. Visiting scholar Liu Xiaogan of Princeton University writes concerning the Taoist system. "In its popular forms it is represented by a pantheon of gods, spirits, and ghosts, and it has absorbed almost every ancient practice known to the Chinese people, such as offering sacrifices to ancestors, praying for favorable weather, and dispelling evil spirits." (Our Religions, p. 284.). This foundation explains the popularity, on an individual level, of the religion. To understand Taoism is to appreciate the alternative world view it offered to Confucianism. Confucianism--classical, socially oriented, geared to public functions of Chinese families and the state, accepting of social duty and responsibility with an influx of rules, laws, ceremonies and traditions--soon became a system of social and psychological pressure. A diversion was needed. With romantic simplicity, openness and artistic wisdom. Taoism offered a departure. Withdraw from the endless struggle and conflict...prize the individual life. Seek unity with nature. Obtain inner space and peace, freed from the excesses of confining Confucian practicality. Tao, as the "path" or "way," emphasizes major themes. a. Transcendence Taoism seeks to surpass the limits of the ordinary. It seeks an ultimate reality which is behind all, a mystical insight which is beyond the scope of words. Way of the Universe. Taoist thought identifies the way of the universe, the pattern, rhythm, driving power, the ordering principle behind all life. In this sense, Tao (and the Taoist religion), becomes the integrating principle behind all of life. Tao means the way of human life, that is, the way life should be. Tao is the natural guiding force which enables all things to realize their full potential...to be fulfilled. Quest for long life became a Taoist goal. Stemming from the focus on nature, with its rhythm of constant renewal, and trying to emulate that rhythm, Taoism focused on techniques to prolong life. In the Classic of Great Peace, an expression of the common values of the Chinese people, long life became a most important goal between heaven and earth. Taoist thought sought to conserve life in many ways. In keeping harmony within the spirit and material forces within the body, a life inducing heart, mind and will ensued. "Lao Tsu said, "The more you know, the less you understand." He also said, "Not-knowing is true knowledge..." How can this be? It would seem that Lao Tsu was telling us not to think. On the other hand, Confucius once said, "If one learns but does not think, one is lost; if one thinks but does not learn, one is in danger." Again, these two traditions seem to contradict one another until we take a deeper look at how each philosophy regards education. In the Western world, when we think of education, we generally think of schools and universities. These are the institutions through which we achieve our learning. In the Taoist tradition, institutions are regarded with suspicion. They are looked at as going against nature by forcing people to be what they truly are not. However, education for the Taoist is a solo quest, without walls and boundaries. The Taoist seeks to understand the naturalness of everything as it exists in the present. Instead of trying to know each separate piece, the Taoist tries to understand the whole, for the whole is the Tao. We can say that we know someone, but we do not understand them. But to say that we understand someone, is that not better than saying that we know them? In Taoism, the key is not to know something; the key is to understand it. One goes about this through self education and transformation. This kind of education is also natural; it just needs to be recognized. In addition, the Taoist is an educator in a sense. The Taoist teaches by example. Lao Tsu said, "The Master, by residing in the Tao, sets an example for all beings." Naturally, when others see one who is enlightened, they will realize it, and they will learn. In Confucianism, too, it is self , and not institutional education, that is important. This may seem to contradict the stereotype of the Confucian scholar who studies the classics for years, takes the exams, and works on society; and it does. However, according to Confucius, people must first recognize themselves and their potential. This is at the heart of Confucian education. Confucius believed that in order to know about anything else in the world, we must first know ourselves. People must educate themselves as to how they fit into the world around them. This is Confucian knowledge; it is obtained by both the learning and thinking processes working together. The Confucian master, like the Taoist master, is also a role model for society. By knowing his place in the world around him, and by following the way of the chun-tzu, the Confucian teaches by example. Others recognize him as such and will learn from being around him. Therefore, when we look at the deeper meaning of education, we see that Taoism and Confucianism are very close in thought. We must know the importance of self realization and understand how we fit into the whole. We must teach others by example. This is a very important form of education. In this way, we will be better prepared for the greater education that is life itself. Regarding the last main point, enlightenment, it may again seem that Taoist thought and Confucian thought differ greatly. For the Taoist, enlightenment is a process of realizing, following, and becoming one with the great Tao. On the other hand, Confucianism is generally thought to not deal with anything that is not concretely in this world; its concern is humanity. When we take a deeper look at what it means to be enlightened, we find that these two philosophies are seeing eye to eye. In taking this deeper look, let us look at transformation as a way to enlightenment. To the Taoist, enlightenment is a continual, constant process. This enlightenment is first obtained by gradual transformation of the self until the Tao can be realized. Gradual transformation is obtained by following the way of the Taoist as passed down from generation to generation. The same is true in the Confucian context. Confucianism is not a static, unyielding philosophy concerned only with human interactions and the workings of good government. These are merely aspects of that which lies at the center of Confucian philosophy. At the center you will find that transformation of the self gives rise to all other Confucian ideas and, ultimately, to enlightenment. In Book I of The Analects, Confucius says, "It is upon the trunk that the gentleman works. When that is firmly set up, the Way grows." This "Way" is the same Taoist "Way": the Tao. Confucius himself recognized that the attainment of the Tao is the ultimate enlightenment. Therefore, both Taoist thought and Confucian thought place the Tao at the center of their philosophy and as their goal. The difference between Taoism and Confucianism is seen in the words chosen to express enlightenment." The extraordinary parallels between ancient Indian and Chinese Taoism in its various forms and Hinduism (Vedanta and yoga) do not appear to have been documented by historians. "Taoism was originally an esoteric philosophy, concerned with the unity underlying the opposites and diversity of the phenomenal world. Taoism taught union with the law of the universe through wisdom and detached action. The union of cosmic and individual energies is reminiscent of the Vedanta teachings of India. As central to the Taoist tradition as the concepts of yin and yang are the ideas of Tao and Te ("the power"). Like yin, Tao is often identified with the passive (or wu wei); because the way is often given preeminence over the power. It is said a real seeker of wisdom knows the power (Te) but seeks the way (Tao). One should not strive for wealth or prestige and that aggression is to be avoided. As part of the Taoists' practice, followers have incorporated lifestyle rituals, such as vegetarianism, herbal and tactile medicinal approaches, good moral conduct, and the use of appropriate incantations, amulets, and charms. T'ai Chi Ch'uan, with its fusion of energetic and relaxed exercise, has provided a means of increasing and enhancing ch'i (or Qi), the vital force of life. The overall goal of Taoists' life is to attain harmony with the Tao. This means one must desire nothing, live simply, and act by not acting. It is a practice where solitude and individualism is cherished and where the "upper classes" of social standing are rejected. Taoism has also developed its own yoga techniques, which parallel the ancient Hindu system of kundalini yoga. These involved control of ch'i, the force believed to stand behind sexual activity, but which could also be diverted into different channels in the body for blissful expansion of consciousness. The circulation of this generative force in the body, aided by breathing techniques, corresponds with Indian yoga techniques involving pranayama breathing, and the ascent of kundalini energy through the chakras or vital centers of the body. This individual alchemy was variously known as k'ai men (open door), ho ping (unity), or ho hsieh (harmony). The extraordinary parallels between ancient Indian and Chinese Taoism in its various forms and Hinduism (Vedanta and yoga) do not appear to have been documented by historians. The yoga teachings of China descended from teacher to pupil; it is only in recent times that basic texts have been translated into English. There are now teachers of Chinese yoga in Western countries and centers for instruction. There are also many translations with commentaries of the earlier Tao teachings in the Tao-te-Ching."